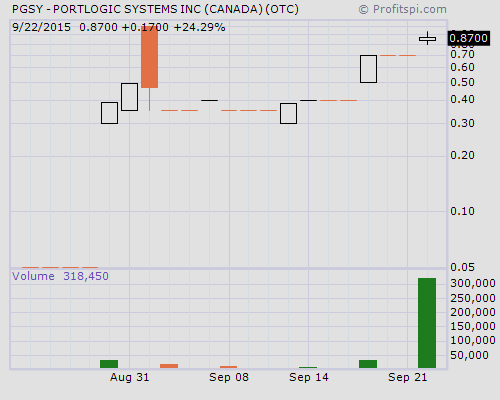 Tuesday, Sept. 22, was finally the day that the long awaited pump and dump of Portlogic Systems Inc. (OTC: PGSY) finally arrived. Having received emails in their spam folder from Breakaway Stocks less than two hours before the opening bell which read “PGSY Set to Rise 2793 pct.. See How Inside,” shares of the wishful thinking, “no significant assets or financial resources” Company traded well enough for early buyers to flip for as much as a 17% gain. With this expected to be a program that extends through to the end of the month, waiting for that dump-dip to get in for a quick bounce seems more logical than falling for fake buyout possibilities and industry comparisons of “real” mobile business giants. Over the years, we’ve covered Portlogic Systems’ PGSY stock in anticipation of them being the ticker of choice to get promoted by the now defunct Awesome Penny Stocks crew. Created last decade with the intent to offer marketing mobile applications solutions and kiosk hardware and software products, with m2Meet, m2Bank, m2Market and so on, the 10K filing from last week shows that revenues have declined significantly (from $809,383 FYE May 31, 2014 v. $122,768 FYE May 31, 2015). More to the interest of buyers will be the additional $176,390 in convertible loans issued during the fiscal year – convertible into shares that the recipients of those email alerts will be forced into buying. Landing page promotions like what PGSY is on used to be awesome ways to get the word out to lonely traders who were new to penny stocks, one which Tobin Smith used to be the feature face of in prior years. Now, without a face for Eric Dickson, the Breakaway Stocks’ version of StockTips’ Mike Statler, the hype of having gotten the alert when the graphics created show PGSY is best bought under $2, with “the very real chance to make 656% profits from buying just this one stock,” proved today that a sucker really is born every day. PGSY could be the best move you’ve ever made for your financial future. I believe PGSY is destined for greatness… And by grabbing shares now, you can lock in your chance to profit by take advantage of the advanced knowledge you have on this all-but-guaranteed stock superstar. Is Portlogic Systems the next Skype or WhatsApp? All signs would point to a resounding “yes”! it only matters that PGSY could be potentially bought out by ANY one of these companies – and if that happens – you could change your financial outlook, quite LITERALLY, overnight! BIDDING WAR!! Skype Sold To Microsoft For $8.5 Billion! WhatsApp Sold To Facebook for $19 Billion! Imagine If Microsoft or Facebook (Or Others) Want PGSY All For Themselves? if you invest just $2000 you could walk away with a nice $13,120… If you’re able to grab $5K worth of PGSY – your total profit could be an incredible $32,800… And a $10K investment means you could pocket a $65,600 windfall!! The word “windfall” partly describes what WILL happen to PGSY come October (or sooner). The worm on the hook for those who do decide to dig a bit is that Jueane Thiessen, founder of Portlogic Systems, owned 30,010,002 of the 33,525,784 shares outstanding as of last week, September 15, 2016. Those “subsequent events” that included Fenwood Capital LLC getting 1,000,000 shares by way of conversion, as did KJV Property Group LLC, and the 1,250,000 shares Haynes Gallo Wealth Management Ltd. received are what’s to be traded until the $10,000 for 200,000 shares ($0.05 per share) are received by Fenwood Capital. The timing of the PGSY promotion, right off the filing of their 10K, creates a perfect scenario for those unfamiliar with what lies beneath the wording to think the SS is good enough to gamble on. After 3 changes to the SS, 2:1 FS effective January 20, 2010, 3:1 FS effective March 30, 2012 and the 1:750 RS effective March 16, 2015, if you really think the float is just 3,515,782, your’e in for a big surprise when PGSY shares reflect what happened to Skype crashing on Monday when the stock is down big in October. Last updated by Timothy Richards at September 23, 2015 .